African Hunting Dog Skull. Lycaeon pictus. Canidae. 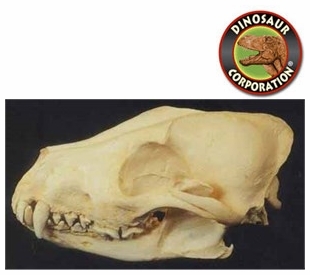 African Hunting Dog skull replica is cast from original specimen. The African Wild Dog, Lycaon pictus, also known as the African Hunting Dog, Cape Hunting Dog, Painted Dog, or Painted Wolf, is a carnivorous mammal of the Canidae family. The Afrikaans name for the African Wild dog is Wildehond, and in Swahili, Mbwa mwitu. It is the only species in the monotypic genus, Lycaon. As its name indicates, it is found only in Africa, especially in scrub savanna and other lightly wooded areas.